It was like war zone at Onipanu area of Ikorodu Road, Lagos, on Friday after a soldier was allegedly knocked down and killed by one of the buses in the fleet of LAGBUS on the BRT lane. 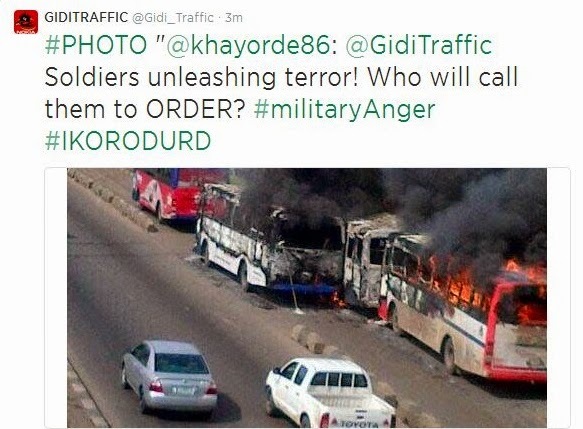 The soldier was said to have been knocked down after he allegedly rode on the BRT lane and subsequently died as there was no immediate medical attention. 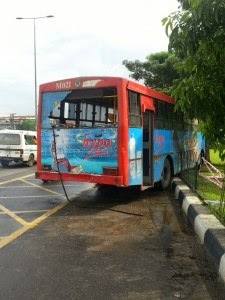 The driver of the bus, it was gathered, fled after the accident. It was learnt that a few hours after the soldier, identified as Matthew Ishaya, a lance corporal, was knocked down, some military men from the Intelligence Unit of the Nigerian Army at Yaba, stormed the Onipanu area of the highway, demanding to know the circumstances surrounding the death of the soldier. The military men were said to have been incensed that their colleague was allowed to die after he was knocked down when he could have been rushed to a nearby hospital for medical attention. Hell, however, broke loose shortly after the soldiers sighted the lifeless body of Ishaya in the bus that knocked him down. They allegedly blocked one side of the ever-busy road, stopping any BRT buses plying the route, four of which were allegedly set ablaze. The shed at the bus stop was also not spared as it was razed. Some commuters and pedestrians, passing through the area alleged that they were manhandled by some irate soldiers, who equally barred journalists and itinerant photographers and social media enthusiasts from recording or taking pictures of the mayhem and that of the deceased. A spokesman for the Army formation in Yaba, Lagos, Rightman Ogeh, however, denied that the soldiers from the unit burnt buses or harassed passersby or commuters. Ogeh, who spoke to a radio station in Lagos on Friday, admitted that the soldiers from the unit were aggrieved that the man, who was knocked man, was allowed to die because no one took the initiative to rush him to any hospital. He said, “A soldier, who was passing through the bus stop, saw the soldier and called the office because he could recognise him. By the time we got there, we realised that our colleague was inside the bus already dead. Ogeh denied that the soldiers burnt the busses, accusing some miscreants in the area of perpetrating the act. “When things like this happen, you will hear different versions, but I can tell you that soldiers did not burn the busses. It is possible that some area boys carried out the act. No one was harassed by soldiers; we only stopped some people who were taking pictures and wanting to film the area,” he added.